Nile City Towers in down town Cairo. Clashes erupted at downtown Cairo's Nile City Towers on Thursday afternoon with at least one death reported. Dozens of civilians with molotov cocktails have set light to several parked vehicles beside the Nile-front complex and attacked parts of the building. Security and emergency services have arrived at the scene in a bid to quell a potentially flammable situation. The Nile corniche road is currently completely blocked to other traffic. The assailants came by three microbuses and several motorcycles then blocked the street after a man had been gunned down by a police officer, according to a report at Ahram's Arabic-language news website. A statement issued by Orascom Construction Industries, which has an office in the towers, claims the incident was sparked when a man entered the adjoining Fairmont Hotel and demanded money, threatening people with a knife. A police officer confronted the man and was attacked, the statement said. The officer shot and killed him. "Immediately after the residents of the shacks behind Nile City came to attack the hotel and tried to burn it down," it said. 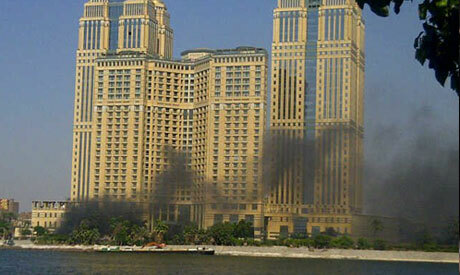 The management of Nile City sealed the building after residents began to burn motorcycles and cars in the forecourt. The violence is focused around the north tower and the adjacent Fairmont Hotel. Injury and death tolls are yet to be confirmed. Ahram's Arabic-Language site said that at least one was injured after being shot. Local residents previously attacked the towers on 27 June when staff there allegedly refused to provide water to put out a fire that had engulfed one of their wooden shacks and led to the death of a five-year old boy. These residents live on valuable Nile-front land and have been involved in a long-running dispute with developers seeking to acquire prime Cairo real estate. Cairo Governorate issued a directive on 20 June authorising local police to evict them.